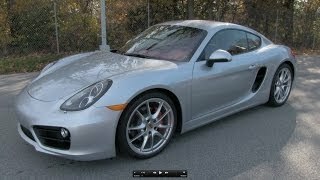 Porsche has unveiled the 2014 Cayman at the 2012 LA Auto Show. The new Porsche Cayman sets new standards in its class for driving performance with a longer wheelbase, all-round new chassis and lower weight. It also has unique fog lights and an aluminum hatch that has an integrated spoiler which is higher and deploys at a steeper angle. With its specific power of 101.6 hp/litre, the 2.7-litre engine is the first Cayman to break the magic 100 hp per litre displacement barrier for sports car engines. Both engines now produce their maximum nominal power at 7,400/min; it was 7,200/min previously. 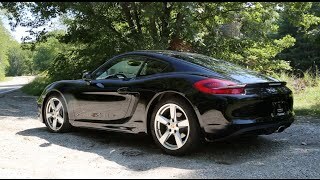 The power is increased by 10 hp to 275 hp (202 kW) in the Cayman and by five hp to 325 hp (239 kW) in the S-model. It enables the Cayman model to accelerate from 0-100 km/h in 5.4 seconds, before hitting a top speed of 266 km/h (165 mph). 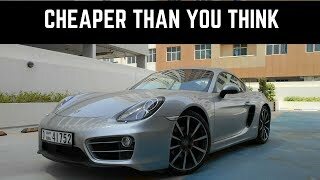 The Cayman S runs from 0-100 km/h in 4.7 seconds and has a top speed of 283 km/h (176 mph).